Project 1245: S. Werning, S. J. Nesbitt. 2015. 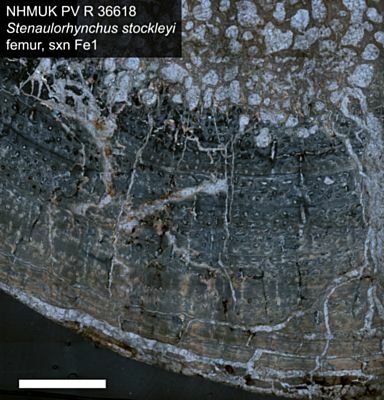 Bone histology and growth in Stenaulorhynchus stockleyi (Archosauromorpha: Rhynchosauria) from the Middle Triassic of the Ruhuhu Basin of Tanzania. Comptes Rendus Palevol. Partial skeleton including rostrum (mostly R maxilla and R dentary, but also including mandibular symphysis and anteriormost portion of L dentary), 14 vertebrae, rib, partial left and right humeri, left femur, right and left tibiae, right and left calcanea. Femur, mid-diaphysis, partial cross section, circularly polarized light. Scale = 2mm. Section Fe1.